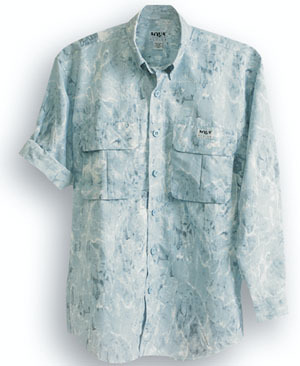 Stealth, sun protection and comfort are important when fishing – that's why we love these Aqua Design shirts. If a fish can spot a size 22 midge, they can certainly spot a 6-foot angler wearing the latest "fashionable" colors. These proprietary designs imitate the patterns of light, color and reflections that fish see through the surface, helping you blend into the background. This shirt features 50+ UV protection because nothing ruins your trip like a bad sunburn on the first day. The fabric is 100% brushed microfiber, which wicks moisture away from skin. Features include two chest bellows pockets, button down collar, mesh vents, roll-up sleeves with tabs, square shirt-tails for in or out wear and several tabs for hanging tools. Available in Sky Blue for open areas Forest Green for tree-lined backgrounds or Sand for rocky/sandy areas. Specify color choice first: Sky Blue, Forest Green, or Sand; then choose size.